I have sat in on many discussions with other parents who have children with dwarfism. I most enjoy those which have both average stature as well as short stature parents. Opinions on child rearing sometimes vary between the two; I feel these types of group discussions give me the most insight. The parents who have dwarfism themselves, have been there before; not only do they relate to what their child is going through, but also have that experience their parents handed down to them. Recently, for the first time, I realized there is one topic which short stature parents couldn’t possibly be experts at. That is, “Mom, you don’t understand.” Whether or not their child has ever said it, they do understand. This is one thing my child can say to me, which often leaves me at a loss for words. I try. I remember the many parent meetings I’ve been to. I have been advised about different ways to answer that statement. But the fact remains … I don’t understand. Those who follow me on Twitter have seen my tweet, “There are places you will go where I cannot follow.” This is what I mean. It is an unsettling feeling to be confronted with. I should be able to take from my own experiences and share with my child that wisdom. This past week, my son and I were at the public pool. 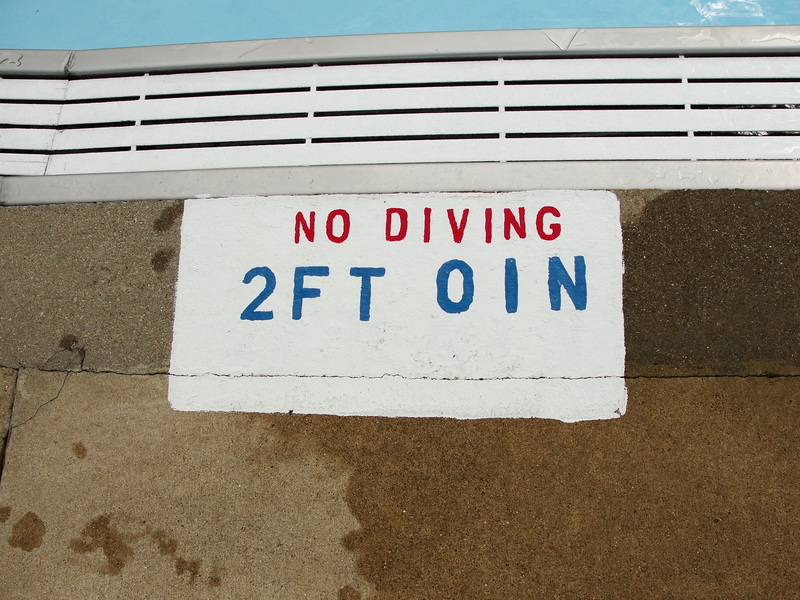 We usually stay in the shallow end, in fact we make the trek to an outdoor pool which has “zero entrance”. It is like a beach, you can walk in and stay in a comfortable depth; I must admit, I’m not enjoying the 2′ depth as much as I used to. However, as he gets older he will be more adept at swimming, and feel safer in the deeper area. Let’s face it, we all tend to stay in an area we can stand in if we need to. For him, that just happens to be well under 3′. So there we were at this great pool, complete with child area and various heights of water slides. This day, the big slide caught my son’s eye. “I think I’m about that tall! Let’s go!” he delighted as he grabbed my hand to pull me along. “Mom, c’mon, it’s right there…let’s go!” He was doing that same anxious dance like kids do when the ice cream truck is coming. “I’m telling you I am as tall as that line!” He sounded like he was trying to convince both of us. I stopped and sat on a nearby bench. From the distance we were, I’m sure it looked that way to him. 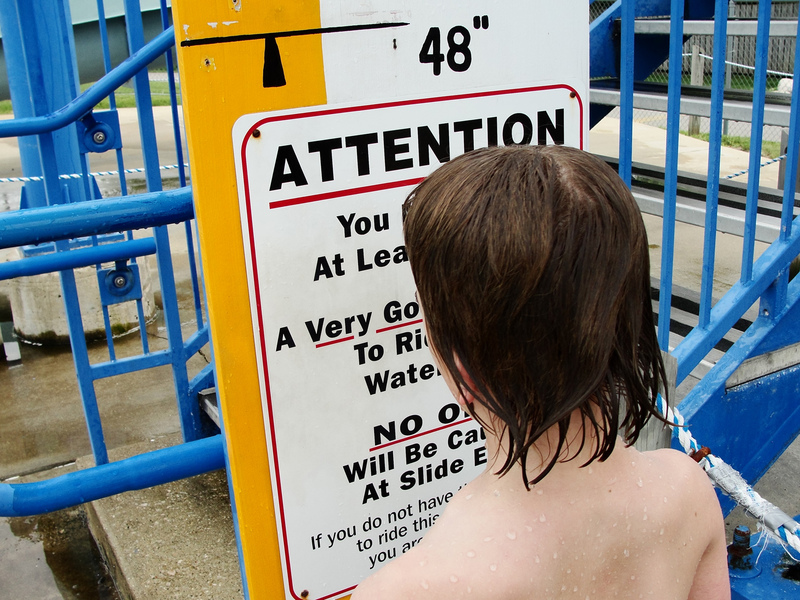 Nonetheless, he knows how tall he is, and it is not 48″. He finally stopped and climbed up on the bench beside me. “How long before I can ride that?” He watched the other children coming out of the tube as they slid into the water with giddy screams. I remained quiet, watching him work this out. “About that.” I answered with my best motherly smile. I’m not sure what he was going to say next, but I got the feeling his friends and family members were running through his mind. We had dealt with this before, it is perfectly normal. Frankly, I’m not sure at what age those questions are finally put to rest in his mind. It has got to be a difficult concept to grasp, that you really are going to defy the norm. That you are different from everyone around you, and that is not going to change. “Honey, when you are 16 or 18, years old, you will be about 3 inches taller than that line.” I used the same tone I always did, however, statements like that one are usually followed by a pro to the proverbial con. I couldn’t think of one for this. I stumbled with some stupid cheery sayings, but that only served to insult him. He started to walk back toward the shallow end as kids ran by him to join the others on the slide. I called after him, but he kept walking. “You just don’t understand.” He said, and walked past me. He was right. Nothing from my childhood, or adult experiences could be pulled to use as a source of reference. He turned and read it. For a moment, I wasn’t sure if that was going to help or not; he’s not the best of swimmers now. “I can do that. I just have to practice really hard.” A determined smile formed at the corner of his lips. “I believe you can.” I said, as we walked back. Once again, all was right with the world. That is, until we go the summer carnival with his friends. But we will deal with that another day.